I Clean Carpet And So Much More LLC is proud to provide area rug cleaning in Overbrook Hills Pennsylvania. You deserve a clean rug. Your Overbrook Hills family deserves a healthy rug. Embedded in your area rug are tiny bits of dirt, hair, dead skin, dust, mites, bacteria and more. There are many ways to clean your Overbrook Hills rug, but it takes a trained expert to examine the rug's weave, fibers, and colors to determine the best and safest cleaning method. I Clean Carpet And So Much More LLC is happy to pickup your area rug and transport it to our cleaning facility and deliver it back to your Overbrook Hills Pennsylvania location in clean condition. 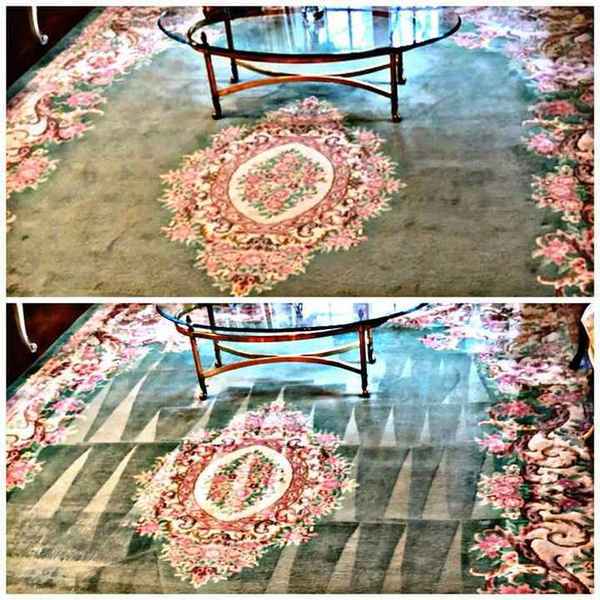 When it comes to fast thorough area rug cleaning in Overbrook Hills Pennsylvania, no one beats I Clean Carpet And So Much More LLC's in-home pickup and delivery rug cleaning service. 5★★★★★ - "Vert professional, courteous, and fair priced." 5★★★★★ - "I would hire them again." 5★★★★★ - "Very professional job." 5★★★★★ - "They were courteous, and did a good job." 5★★★★★ - "It was great." 5★★★★★ - "OMG!!! I just got home!!! The carpets look absolutely amazing!!! I am soooo happy I went with you!! Fantastic!!! More than I could have hoped for!!! Excellent work thanks so much you are on my speed dial and will be in touch again very soon, I highly recommend you"
5★★★★★ - "Seth did an amazing job cleaning the grout in our tile and polishing the wooden floors. He was upfront, honest, communicated and tinelt. He even came back a 2nd time after the grout cleaner dried to take care of the edges. Highly recommend!!" 5★★★★★ - "This is company is a 5 star across the board! Seth was extremely professional. He was on time and called before to confirm. As far as his service, he cleaned two wall to wall carpets and a couch. He did a phenomenal job and took extra steps like scotch guarding everything he cleaned! He's super nice too. And, came out on Labor Day. Who does that??? I will definitely use Seth again!" 5★★★★★ - "Very professional and considerate." 5★★★★★ - "Met my expectations, this was the first time I have used them and I can see the difference after the carpets were cleaned-Awesome job! I have used Stanley Steamers and other private cleaners, they did not meet my expectations. The carpet in the bedroom and stairways looked new and fresh after they were cleaned. I would highly recommend to any residential or businesses for the carpet cleaning service. Thanks for your service." 5★★★★★ - "Very polite and does a great job. My carpets look brand new. Highly recommend." 5★★★★★ - "I have used other carpet cleaners in the past, most recently Stanly Steamer, who did a good job, but the work done by this local company was extraordinary. Beginning with the ease of making the appointment, the excitement of the order taker and confidence in the work led me to give it a try. They were incredible, professional, very thorough and understanding of pets and stains. The carpet looks brand new and the room smells wonderful. We have a little rescue pup that is getting used to our home and not always 100% on her house training yet, that couple with regular wear and tear made this light wheat carpet look horrid. I am going to have a houseful of little ones for the holidays and no doubt they will be rolling all over the rug playing etc. The best thing I can say is I feel 100% confident in their safety and I git the feelings that this company feels very passionate about their work and keeping families in a healthy and polished environment. So very happy, choose them, you will be astonished!" 5★★★★★ - "He was extremely timely, fair, and nice. He went out of his way twice for us. I couldn't recommend him more." 5★★★★★ - "Matt Stupal was excellent. Very polite, very thorough, worked relentlessly to get every stain out. Plus was great with our dogs! I highly recommend him and this company." 5★★★★★ - "Seth did a phenomenal job on my tile floor. I moved into my new house a few months ago. The kitchen floor was impossible to get clean, I tried everything on the market. I did not have the money to replace the floor. Seth worked around my schedule, was courteous, professional and delivered the results he promised! I am beyond pleased! He really brought my old floor back to life!" 5★★★★★ - "Seth was great! He was extremely professional and friendly. My carpets and sofa look awesome! I would recommend Seth to tackle your cleaning needs!" 5★★★★★ - "Awesome company! Reliable and affordable!!!" 5★★★★★ - "Seth did an amazing job cleaning the grout in our tile and polishing the wooden floors. He was upfront, honest, communicated and timely. He even came back a 2nd time after the grout cleaner dried to take care of the edges. Highly recommend!!" 5★★★★★ - "Did a great job, on time and professional." 5★★★★★ - "Very prompt response to my request, very acommodating to the time needed for service, courteous and professional. Quality of work was superior. My tile floor looks like new, they seal both the tile and the grout. Carpet also looks like new. I will definitely use them again!" 5★★★★★ - "We are very happy with our carpet cleaning. Friendly and professional." 5★★★★★ - "The tile cleaning was done in a professional way! The large area of tile in my family room and kitchen look as good as the time of installation. The flood looks perfect!" 5★★★★★ - "excellant work, and fast"
5★★★★★ - "very reliable,on time,excellent work and customer service,great price. Would recommend to others." 5★★★★★ - "Professional, courteous, knowledgeable and works well with eldery." 5★★★★★ - "Arrived on time. Max was able to clean some carpet areas that I thought would be impossible to rid of the stains. I'd recommend Max to anyone." 5★★★★★ - "Very personable. Wanted to make sure that I was satisfied." 5★★★★★ - "Very professional, highly recommend." 5★★★★★ - "The carpet technicians were polite, knowledgeable, and efficient. I plan to recommend them to my friends." 5★★★★★ - "Professional, courteous, Punctual and sincere!" 5★★★★★ - "Great job! My 15 year old carpets look like new!! Very easy to do business with!" 5★★★★★ - "They went beyond duty to restore and clean my floor which a previous company sealed the floor with a wax/glue. Tech was awesome." 5★★★★★ - "He did an excellent job. Our floors look new again." 5★★★★★ - "Very courteous and hard working. I will hire them again." 5★★★★★ - "Great service and incredibly nice people!" 5★★★★★ - "We were on the verge of getting new carpets when my friend recommended this company. I’m so thankful she did! We are so pleased with the results." 5★★★★★ - "Great service! I’m in my 70s and live by myself and get very weary when it comes to having strangers in my house and Seth made me feel extremely comfortable and went the extra mile and then some. I Clean Carpet was on time, professional, and extremely courteous. Seth went out of his way to get my carpets looking brand new! He took the time to explain to me what my carpets had deep down inside them and when I saw what he was able to extract from them I was shocked! I can’t believe I had my grand babies crawling around on such filthy floors. I will most definitely be getting my carpets cleaned every 4 months by I Clean Carpet and So Much More. If you want a hassle-free and pleasurable experience this is the company you need to call. From beginning to end I have nothing but fantastic feedback." 5★★★★★ - "Got in contact by reference. The guy Seth Brower is so frank and such a good person. He explained me everything about the carpet cleaning. The chemicals they use to clean the carpet are all good one. Never thought the carpet will look such a good after clean. Really liked the work of Seth Brower. Will sure hire him in future for all my carpet cleaning works. I will suggest him the most for carpet cleaning works." 5★★★★★ - "Seth came in to take care of the office carpets my dog had stained up with peanut butter, mud, and layered with fur. I expected him to tell me there were spots he couldn't get out, but everything was removed when was done! His van and tools made the visit very easy." 5★★★★★ - "Seth did a great job cleaning our kitchen grout! Very professional and at a great price!" 5★★★★★ - "Highly recommend Seth!!!! AMAZING WORK!!!!!!!!!!!!! My carpets look brand new!!!!!!!!!!!!! Thank you thank you thank you!!!!!!!!" 5★★★★★ - "My Floors look absolutely amazing. I didn't think it was possible."